Investigating the energy released from burning different alcohols. 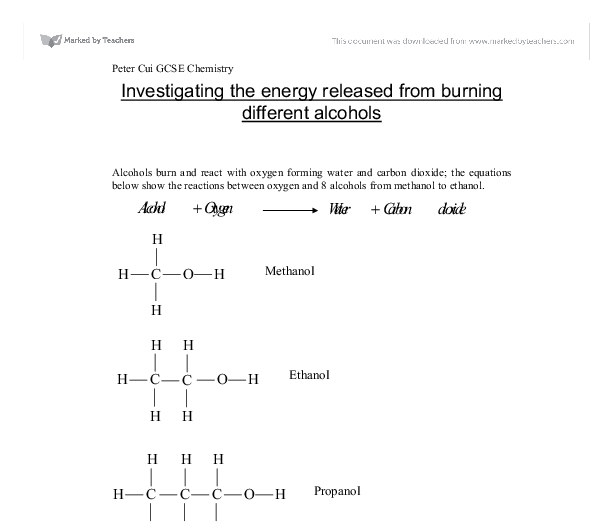 Investigating the energy released from burning different alcohols Alcohols burn and react with oxygen forming water and carbon dioxide; the equations below show the reactions between oxygen and 8 alcohols from methanol to ethanol. For these reactions to start, energy is required to break the existing bonds between the atoms of molecules of the reactants. For example in methanol, C-H bonds, C-O bond and O-H bonds and O=O double bonds need to be broken, energy is required to break these bonds as well as others in the reaction. However when new bonds are formed between atoms at the end of the reaction: C=O double bonds as well as O-H bonds are formed and as they are formed they release energy. As the energy released from the new bonds formed is more than the energy required to break the old bonds, the reaction is exothermic, overall it release energy into the surroundings. The aim of this investigation is to find out how the energy released from the different alcohols differs. Hypothesis My hypothesis is based upon the theoretical values of the different heats of combustion of the alcohols. Each will be different as different number of bonds will be broken and different number of bonds will be made, although in each case all of the bonds broken and made will be the same for each alcohol. Alcohol Theoretical Values (kJ/mol) Methanol -656.5 Ethanol -1272 Propanol -1888.5 Butanol -2505 Pentanol -3121.5 Hexanol -3738 Heptanol -4354.5 Octanol -4971 Below is a graph drawn from the values in the table above showing the relationship between the different alcohols and the heats of combustion for each alcohol. From the graph we can see that the relationship between the different alcohols and their heats of combustion is a straight line on the graph. Therefore the according to the graph the heats of combustion should be directly proportional to the alcohol, and as the heats of combustion are going up as the alcohol molecule gets bigger, we can also say that they have a positive correlation. ...read more. To make the investigation safe, goggles will be worm, alcohol can cause damage to eyes, therefore eye protection must be worn at all times. As the copper can may get hot after the burning, therefore tongs will be used to handle the cans rather than with hands to prevent hands being burned. In addition, the alcohol burners will be lit with splints, as this is the safest method of lighting them. The results of this investigation will be recorded in a table and graphs will be plotted to present the information in a more clear way. Results Alcohol Molecular mass Difference 1 (g) Difference 2 (g) Average (g) Percentage of mole Heat of combustion Methanol 32 0.9 0.84 0.87 2.72% 154 Ethanol 46 0.63 0.63 0.63 1.37% 307 Propanol 60 0.52 0.51 0.515 0.86% 489 Butanol 74 0.42 0.43 0.425 0.57% 731 Pentanol 88 0.42 0.37 0.395 0.45% 936 Hexanol 102 0.34 0.36 0.35 0.34% 1224 Heptanol 116 0.36 0.31 0.335 0.29% 1454 Octanol 130 0.32 0.3 0.31 0.24% 1761 Below is a table displaying the theoretical values, the data book values (accepted as accurate experimental values) and the actual values from the investigation. Alcohol Heats of combustion (kJ/Mol) Experimental results Data book values Theoretical Methanol 154 726 656.5 Ethanol 307 1367 1272 Propanol 489 2021 1888.5 Butanol 731 2676 2505 Pentanol 936 3329 3121.5 Hexanol 1224 3984 3738 Heptanol 1454 4638 4354.5 Octanol 1761 5294 4971 Also included in this investigation are graphs displaying the results from the investigation and also comparing to the theoretical values and also the data book values. Analysis From the graphs it can be seen that there is a very distinct pattern, that the heats of combustion is increases as the sizes of the molecules of alcohol increases. This can seen by that for methanol, the heat of combustion is 154 kJ/Mol, while the heat of combustion of octanol is 1761 kJ/Mol. ...read more. The results are reliable enough for the investigation as the reaction was repeated to ensure that an the average was taken from the 2 sets of results. The 2 sets of results seemed to be very close to each other, showing no significant differences between them. Therefore, it can be concluded that the results were reliable enough for the investigation. To improve on the reliability of the results of the investigation, the investigation could have been repeated more times, taking the average from multiple sets of results. This would have reduced the chance of 1 incorrect result affecting the final results of the investigation. It would also give more results for comparison, to see which results were more reliable than others. If some most of the results were very close to one value, or repeated that value, it show that that particular value would be most reliable to use as a result for the investigation. To extend the investigation, perhaps more alcohols could have been investigated. To see whether the trend shown in the first 8 alcohols also continues with in the other alcohols. This would also give a better graphs as there would be more points on the graph, and it would mean a more accurate line of best fit. For this extension, all the alcohols up to and including quindecanol could be investigated. Firstly their theoretical heats of combustion could be calculated from the bond energies, and then they too could be burnt to see how much alcohol was needed to raise 100g 10oC. However, investigating further alcohols would require more water. If the trend carries on in the alcohols, as the results of this investigation indicates, it would not take long for 100g of water to increase in temperature by 10oC as there would be more energy released from the higher alcohols. Hence more water is needed, or else the reaction would not be stopped in time, and more alcohol would be burned than needed, making the results inaccurate and unreliable. 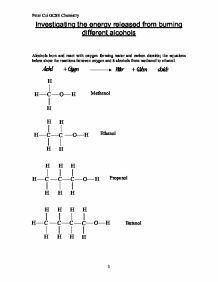 Peter Cui GCSE Chemistry 1 ...read more. This student written piece of work is one of many that can be found in our GCSE Organic Chemistry section. Experiment to investigate the heat of combustion of alcohols. which affects the height the wick was away from the tin can, providing more energy if the flame is higher or stronger. This would alter the reading by increasing the values. Other improvements could be made for a more efficient and accurate experiment, such as better equipment to obtain more accurate results. As an average for the enthalpy change of combustion propanol was also the greater result. I can relate these results to my predictions. The value of ?Hc? for ethanol that I calculated using an enthalpy cycle was -1366.82 kJmol-1. The value of ?Hc? Over the last 300 years, the amount of carbon dioxide in the atmosphere has risen sharply, due to human activities - mainly the increased burning of fossil fuels, and deforestation. The alcohol lamp with methanol, including the cap were weighed and were recorded the mass. 10. The can was clamped in an upright position so that it will be just above the flame of the burner when lit. 11. The temperature was started recording. The Heat of Combustion of alcohol. First aid project - treating common injuries in the laboratory.